Bunkie Knudson’s reputation for producing serious performance machines preceded him on his move from General Motors to Ford, where he immediately went to work burnishing the Mustang’s image with a complete redesign by another refugee from GM, designer Larry Shinoda. That partnership bore fruit in the 1969 Boss 302 and Boss 429. Named after Shinoda’s nickname for Knudson, the Boss Mustangs were unlike any other version of the original pony car, especially the 429, which was built to homologate Ford’s 429 CI “semi hemi” engine for NASCAR. Production began in January 1969 when Ford began shipping Cobra Jet-specification Fastbacks to Kar Kraft in Brighton, Michigan. 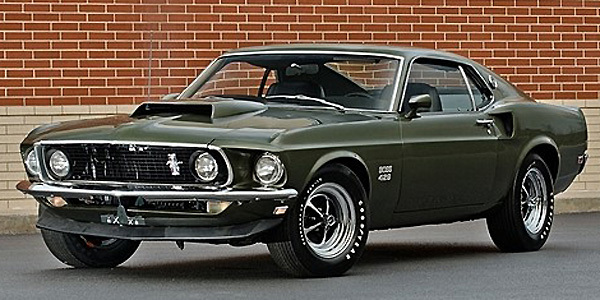 To accommodate the massive 429/375 HP engine the front suspension was lowered and the track widened by 2 inches using spindles and control arms specific to the Boss 429. Other features included fender decals, a manually controlled hood scoop, specific front spoiler, dual racing mirrors, a trunk-mounted battery and power steering and brakes. The 429 engine itself was pure racing material: forged steel crank, four-bolt main bearing caps, forged steel rods, and the trademark huge aluminum heads with crescent-shaped combustion chambers. A Ram-Air-fed Holley 4-barrel, high-rise aluminum intake and special cam pushed power well past the 375 HP factory rating.